[Episcopal News Service] Episcopalians in Ellicott City, Maryland, were cleaning up their homes and businesses on May 29, while helping their neighbors do the same and offering them shelter after torrential rain two days before sent a destructive flash flood through the town’s downtown. “The sun rose on a terrible scene in Old Ellicott City and our surrounding community,” the Rev. Anjel Scarborough, rector of St. Peter’s Episcopal Church, wrote to the parish on Trinity Sunday, the morning after the storm. “As we walked through the West End, we saw nothing but mud and water being pumped out of basements. Rows of homes with their basements completely gutted and foundations washed away — no longer habitable by any means. In fact, at about 9:15 p.m. on May 27, just hours after the flood, St. Peter’s let it be known via Facebook that its doors were open to anyone needing shelter. The church, which sits above the downtown, has since been open from morning until evening with hot food, toiletries (including diapers and feminine hygiene products), bottled water, work gloves, heavy-duty contractor bags, cleaning supplies, shovels and wheelbarrows, according to its Facebook page. Some of the supplies were donated by a local hardware store. St. Peter’s is using its Facebook page to post recovery information. For instance, it shared details about a company offering to help business owners recover data from sodden computer hard drives. “Once again, our St. Peter’s family is called upon to show the boundless, unquenchable love of Christ to our community in a time of need,” Scarborough wrote. The other Episcopal church in town, St. John’s, took on a “quite a bit of water,” according to its Facebook page, but a group of parishioners helped prevent extensive damage. Residents of the west end of Ellicott City’s Main Street need industrial fans, water pumps, shovels and wheelbarrows, a Facebook post said. People who can offer those supplies are being directed to St. Peter’s. 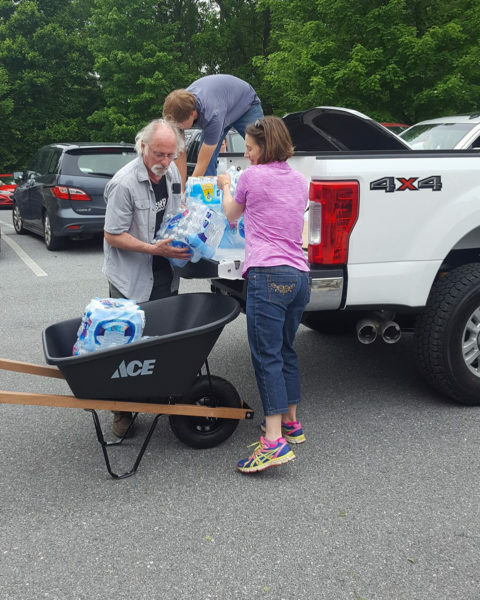 Diocese of Maryland Bishop Eugene Sutton went to Ellicott City on Memorial Day to offer his encouragement and to assess the needs. Locations around Ellicott City and Catonsville received between 5.36 inches and 10.38 inches of rain on Sunday, said Kyle Pallozzi, a meteorologist with the National Weather Service’s Baltimore-Washington forecast office. The heavy rain sent the Hudson and Tiber tributaries over their banks, with the water coursing down Main Street. Muddy water tore through downtown for two hours in the late afternoon. It pushed cars into store windows, forced restaurant customers to seek safety in the second stories of some buildings and sent others fleeing for higher ground. 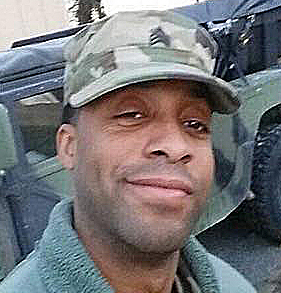 One person, Eddison Hermond, 39, apparently died trying to rescue a person caught in the flood. The off-duty National Guardsman came out of a restaurant to help pet food store owner Kate Bowman who had escaped with her cat from the window of her shop and was in water above her waist. She told police that Hermond was swept away by the water. His body was found May 29 in Patapsco River downstream from Ellicott City. The Diocese of Maryland shared on its Facebook page this post from a local businessperson showing downtown Ellicott City during the flooding. The flood came just weeks after local officials reported that the former mill town was on its way to being fully recovered from similar destruction in July 2016. About two weeks ago, Maryland Gov. Larry Hogan announced that the state and Howard County had been awarded more than $1 million by the Federal Emergency Management Agency to pay for projects aimed at reducing the flood risk in the areas surrounding Main Street.